Given how much I loved Silent in the Grave, I felt a tingle of thrill and anxiety as I cracked open the sequel. The first book had what I consider to be a "perfect" ending. I couldn't have asked for more and wouldn't have wished it different in any way. Such endings are rare and to find one at the end of the first book in a series is rarer still. So, could Silent in the Sanctuary live up to its predecessor? I really, really hoped it could. The second volume picks up several months after the end of the first. Lady Julia is on vacation in Italy, attempting to recover from the traumatic events of her investigation into her husband's death by basking in the Tuscan sun. Her recuperation is cut short, however, when she and her brothers (the delightfully named Plum and Lysander) receive a summons home to England for the Christmas holidays. At the last minute, they decide to take along a young Italian count who has become a friend to all three, but who also seems to have formed a rather strong attachment to Julia. Hmm. Back in England, all of Julia's hilarious and quirky family members are present and accounted for while a few unexpected Christmas guests round out the mix, including a few cousins, an uncle, a dubious clergyman, and one Mr. Nicholas Brisbane. What follows reminded me of a wonderfully late night game of Clue. All the players are charming and suspect in turn and the murder even takes place in the sanctuary with the candlestick! And it remains Julia's and Brisbane's task to ferret out the identity of the killer. May I just say, I continue to love these two reluctant partners. Julia, in all her incorrigible intrepidity, serves as the perfect foil for Brisbane and his ruthless pursuit of the murderer. This second volume includes a few more tantalizing insights into the darkness that is Brisbane, as well as some cracking good repartee between our two lead characters. 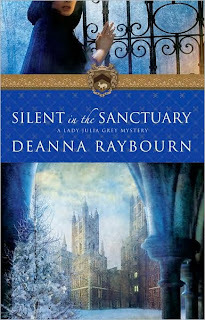 I went in with the highest of expectations and Silent in the Sanctuary more than lived up to them. This series is right on track to become an all-time favorite. Seriously, it has everything you could ask for. Charmingly dry-humored heroine? Check. Tortured and broody hero? Check. Humor, danger, genuine creepiness? Check, check, check. I'm recommending them left and right and can't wait to get my hands on the third installment, Silent on the Moor, due out in March. I loved Silent in the Grave but haven't got to this one yet. I do have it, so I really should move it up the pile. I was delighted with it, Marg. If you loved the first one, I imagine you'll enjoy this one as well. They really do. Anytime they find themselves alone discussing the case, it's a guaranteed delicious scene. Ooh, I think you will love Silent in the Grave. Let me know!